Joomla! is a content management system (CMS) that enables you to build websites and online applications. Note: Joomla! 2.5 is end of life since December 2014. Joomla! 3.x is mobile friendly out of the box. You can find here the version of Joomla! you should use. We recommend backing up your site before making any changes, updates or upgrades. That way you’ll have a copy of it to restore if necessary. Do not forget to test your backups! If you’re not sure how to backup your Joomla! site, follow the Backup Basics for a Joomla! web site documentation. If you find it difficult, seek support within the Joomla! support forums or browse for help in our own webmaster support community. If you’re using an older version of Joomla, follow the directions below. 1. What Joomla! version and template am I using? 1.1. How can I check it? This may affect what changes you can make. These options expand greatly when your installation of Joomla! is up-to-date. Check your administration interface. The version number should be visible on the top or bottom of the interface depending on what version of Joomla! you are using. Check the System Information page in your administration interface. The version number should be appears on that page as well. The version is located in the file /version.php, and can be viewed in a text editor. This file is typically located in /libraries/joomla/ but can be found elsewhere. You can find more methods to check the Joomla! version of your website on Joomla! official documentation. Note: If you feel lost at this point, we would advise you to stop or delegate this task to an expert. 1.2. Update your version, template and third-party extensions if required. If your Joomla! version is not the latest available, we strongly recommend to update your Joomla! installation to the latest version by following the Updating Joomla! documentation, where you can find step by steps tutorials on how to migrate from 1.5.x to 3.x and from 2.5.x to 3.x (note that this documentation is available in several languages). An update to the latest version will automatically apply needed security upgrades and make your site mobile-friendly. Test your URL in the Mobile-Friendly Test tool now that your website software version or templates are up to date. If you get a “mobile-friendly” score, you’re done! If the score isn’t mobile-friendly, consider changing template and/or customizing the current one. We have compiled the following documentation to guide you through the process. 2. How can I make my Joomla! 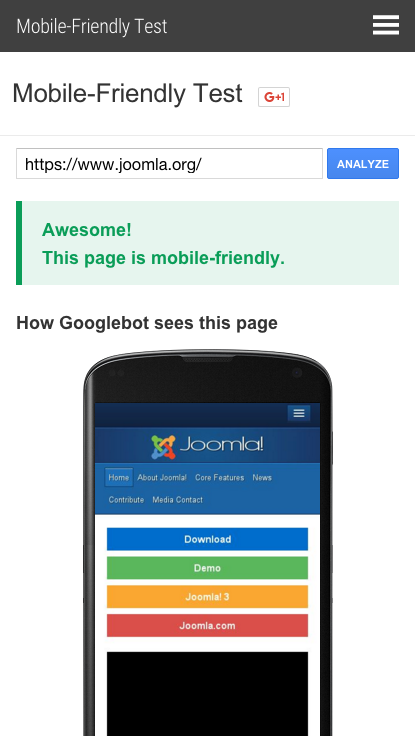 site mobile-friendly without updating Joomla! versions? First, learn how to install a Joomla! extension by reading the Installing an extension guide. Many Joomla! extensions can help you convert your site to be mobile-friendly without updating versions. Visit the Joomla! Extensions Directory mobile section to search for an extension suitable for your site. Read the documentation given with the extension to make sure you know how to install and use the extension. When you’re ready install the extension and apply it to your site. We hope your site is now mobile-friendly and ready to be served to your mobile audience. We invite you to use the Mobile-Friendly Test tool now. If the test results are not satisfactory or you have further questions, Google welcomes you on their international webmaster forums for additional guidance and support. Google is always looking to improve their documentation: feel free to fill in this form with your feedback. This page was last modified on 8 May 2016, at 16:13.